The Islamic Social Services Association, Inc. (ISSA-USA) envisions a spiritually and culturally competent social service network that ensures the highest quality of life possible for every individual, family, and community. The mission of ISSA-USA is to build a network of professional, paraprofessional and volunteer social service providers; and to enhance their capacity through education, training, technical assistance, research, mentorship and collaboration. ISSA was established in 1999 by a group of individuals concerned about the social issues affecting the Muslim community in North America. 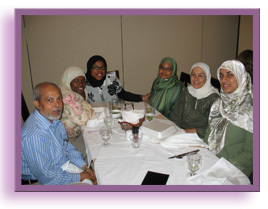 These community leaders believed it would be important to develop a network of Muslims in the field of human services to begin to address the mental health, social welfare, and general family issues that impact Muslims. Additionally, founders felt that it would be important to work closely with secular and other faith professionals to develop a partnership in this work, promote understanding about Islamic traditions, beliefs, and practices, as well as provide a forum to discuss contemporary social issues facing Muslims in America. At the annual conference of Muslim Social Services May 1999 in Virginia, the Islamic Social Services Association (ISSA) was founded and a board was appointed to carry out the objectives of ISSA. Subsequently, separate non-profit corporations in the USA and Canada were incorporated having their own voluntary board of directors for services to be delivered in the U.S.A and Canada respectively. These two boards of directors work together on projects that serve to educate and connect social service providers to the community. Our approach is multifaceted and includes a focus on the secular and other faith providers, Muslim community members, imams, community leaders and professionals as well as promotion of cross-cultural awareness among Muslims. ISSA USA offers a range of workshops and trainings for Muslim, other faith and secular communities that facilitate our approach. Provide training programs for imams, community leaders, Muslim, secular and other faith professionals and paraprofessionals. Provide consultation and serve as a liaison with secular and other faith social service providers. Encourage Muslim students to major in professional education in the fields of social work, counseling, marriage and family therapy, psychology and psychiatry. Encourage and facilitate the publication of research about social service and mental health issues concerning Muslims and to serve as a clearinghouse for resource material.